Milena Joselin Cacho Martinez, selected at age 22, is a leader of the Garifuna town ofMasca. She has worked as an HIV/AIDS prevention counselor for the U.S. Christian organization, Samaritan’s Purse. 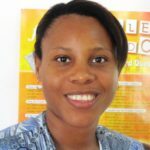 In this position, Milena has provided youth with information on sexuality and gender, sexual abuse, self-esteem and the prevention of HIV/AIDS through abstinence. She has been involved in Garifuna theater and radio programs for many years.